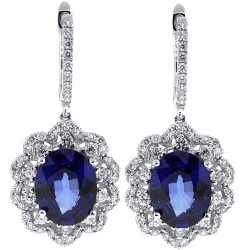 Add a stunning finishing touch to your look with one of our designer earrings for men and women! With over seven hundred designs to choose from, we offer only the highest quality jewels handcrafted by highly experienced jewelers. 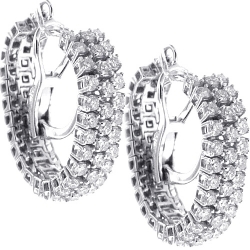 At 24diamonds.com you will find classic pairs of studs, hoops and dangles as well as fancy huggies, crawlers and chandeliers. 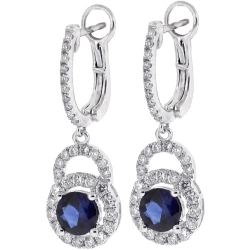 Plain, accented or completely iced out with genuine diamonds, natural gemstones, cultured pearls, cubic zirconia or Swarovski crystals, our earrings are handmade of platinum, 18, 14, 10k yellow, white, rose, two, three tone gold and 925 sterling silver with the perfect gleaming or satin matte finish. Round, square, oval, heart, pear and other shapes with black, white, brown, green, blue and purple colors to match your outfit or pick the favorite combination among our rich variety! 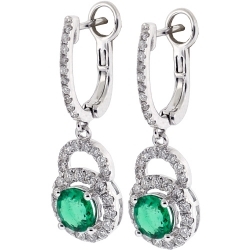 If you enjoy shimmering and shining, our online collection of earrings is the ideal place for you! 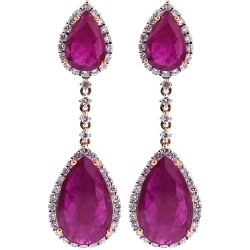 Gorgeous womens earrings are getting their origin from the era of an Egyptian queen Cleopatra in 51-30 b.c. and this type of jewelry still remains one of the most popular one! 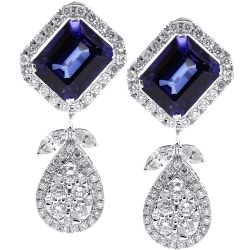 It is almost impossible to imagine a women who does not wear earrings. Most of the ladies wear them daily, but some prefer to put them on for special occasions only. 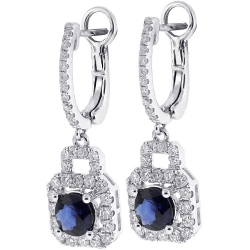 There is no doubt, a long pair of diamond earrings mixed with gemstones would catch a lot of attention and you will get millions of compliments! 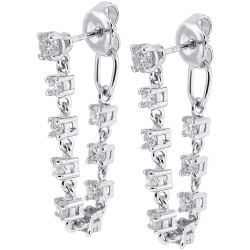 Especially, if this is one of our pairs professionally handmade of platinum, 10, 14, 18k gold or 925 sterling silver. 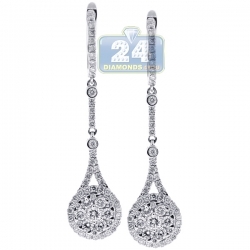 At 24diamonds.com you can find a large selection of exclusive chandeliers, crawlers, dangles, hoops, huggies and studs. From plain gold or silver, to encrusted with top quality diamonds and natural gemstones! Make your choice and start wearing on of these beautiful pairs as soon as possible! 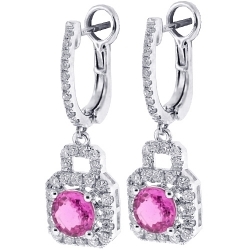 Kids earrings are the most popular jewelries that parents buy online for their children. It could be a great birthday gift or just a spontaneous present for your loved one! 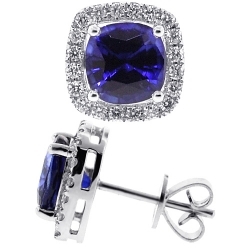 All our earrings are professionally handmade by experienced jewelers and have the highest quality craftsmanship with the exceptional materials used. 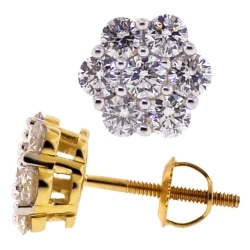 From plain 10, 14k white and yellow gold ball earrings to fancy cubic zirconia studs of round and square shape. 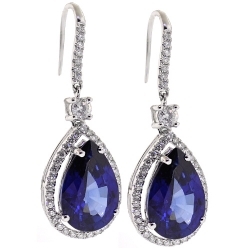 The crystals used are the highest quality, with absolutely clean and bright sparkle like the top quality diamonds. 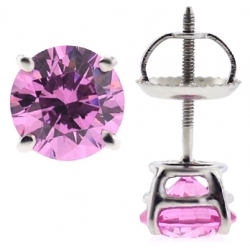 We offer these cz in white or black color to match the outfit or other jewelry your baby in love with! Depending on your preferences, you can choose push or screw back closures for the secure wearing and protection. 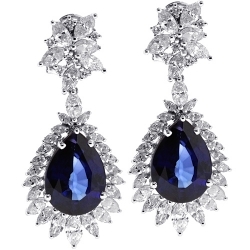 That is no doubt the ears of your kid will be shining and sparkling a lot with one of our pairs! 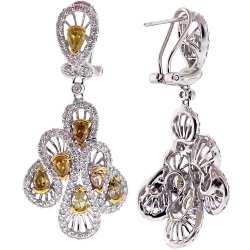 The pair of diamond earrings for women is one of the luxurious way for self-expression and to show your unique taste... like one of these white, brown, fancy yellow diamonds or genuine gemstones which are made by mother nature! 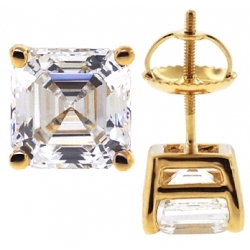 At our online store we carry over five hundred men's diamond earrings and women's one: from breathtaking chandeliers, crawlers, impressive drops, beautiful hoops, classic studs and much more. 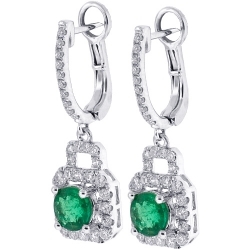 All featured earrings are handcrafted according the highest jewelry standards and have top quality diamonds and natural gemstones to create one of a kind look! Available in 18, 14, 10k white, yellow, rose, two and three tone gold, most of all our jewels have a smooth, polished to the perfection finish, but some come with matte and satin effect. We love combining different colors, shapes and stone types to make a piece you have never seen before! 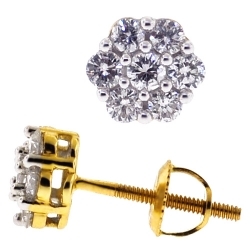 Timeless diamond stud earrings are shining anytime and anywhere! We offer over two hundred styles of diamond studs with solitaire and cluster stones expertly handmade of platinum, 18k, 14k, 10k white, yellow, rose, two, thee tone gold and 925 sterling silver. 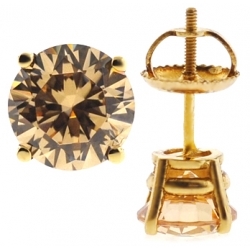 Either with fancy yellow, brown, black, white diamonds, genuine emeralds, sapphires, rubies, aquamarines, citrines, garnets, onyx, opals, pearls or with high quality cubic zirconia and Swarovski crystals, you will find your favorite pair of men's stud earrings at our online store! Absolutely stunning designs with different shapes like round, princess, asscher, oval, heart, sizes, colors and price variations will not let anyone be indifferent. These stud earrings for women are great for daily wear with almost any outfit and other jewelry, but if you are looking for some special occasion studs we are happy to offer them as well! 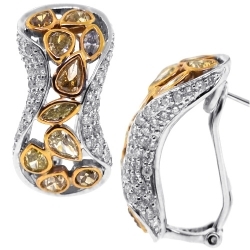 Ear crawlers and cuffs are the latest fashionable trends in women's jewelry world! Already seen on many celebrities, red carpet events, tv programs, magazine covers and other glamorous sources... these are long fancy earrings to cover your ears without hanging in the air. 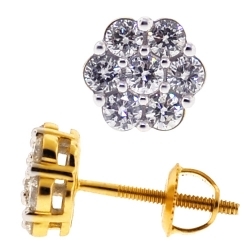 The design offers a combination of classic studs and fancy ear cuffs to make such a new concept really unique and special. Our jewels are expertly handmade of gleaming 14 and 18k white gold polished to the perfection, and featuring absolutely sparkling and eye clean diamonds of white color and pave set. From pyramids, stars to flower and floral designs, various shapes, sizes, closures and themes we have an exclusive selection to choose from! If you are looking for a custom made pair made of yellow or rose gold, please contact us and we will be glad to produce one of a kind piece for you. Gorgeous gold, silver and platinum hoop earrings are the most widely worn and beloved types! The secret is their classic and simple design that always stays timeless and fashionable anywhere in the world: from North America to Japan and Australia. But obviously, there are millions of different variations of the hoops: from fully iced out with round, princess and baguette cut diamonds inside and outside to elegant plain or diamond cut styles! At our website you can find over 200 pairs of different color, pattern, theme, shape and concept... modern, contemporary, vintage and much more! Each pair is a state of art work of highly skilled jewelers and features top quality materials and craftsmanship. 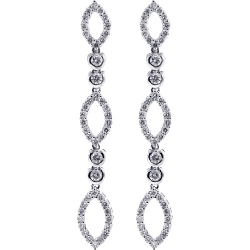 We offer these beautiful hoops in 18, 14, 10k gold grades, platinum and 925 sterling silver. Whatever you like the simplicity or chic, luxurious types, be sure to find it here! 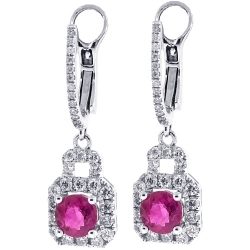 You will be impressed with our fascinating collection of diamond and gemstone womens dangle earrings! 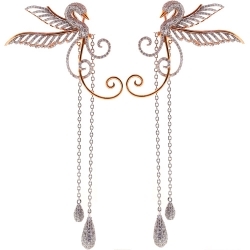 These long and elegant designs impress right away due its natural sparkle and beauty! 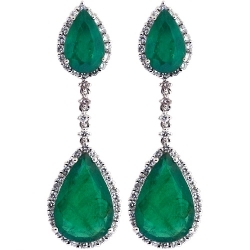 Dangles are great to wear with cocktail dresses to show your individuality and sophistication. 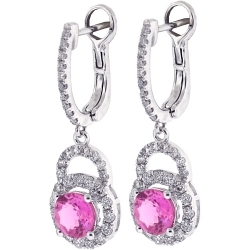 Accented with blue, red, pink, yellow, black, green, white and stones of other colors, the featured earrings are professionally handmade of 18, 14, 10k gold, platinum and 925 sterling silver. If you are looking for genuine emerald, sapphire, ruby, topaz, citrine, quartz, aquamarine, amethyst, garnet, opal, tourmaline, tanzanite or turquoise dangles mixed with genuine diamonds, you are at the right place! Our earrings are available in different styles, sizes and price ranges... from art-deco, vintage, contemporary to modern pieces to make the perfect match with your taste! $1,469.00 CUSTOM ORDER. SHIPS WITHIN 2 WEEKS. $1,128.00 CUSTOM ORDER. SHIPS WITHIN 2 WEEKS. $897.00 CUSTOM ORDER. SHIPS WITHIN 2 WEEKS. $5,396.00 CUSTOM ORDER. SHIPS WITHIN 2 WEEKS. $11,646.00 CUSTOM ORDER. SHIPS WITHIN 2 WEEKS. $9,207.00 CUSTOM ORDER. SHIPS WITHIN 2 WEEKS.